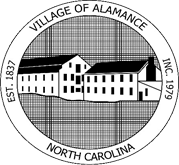 The Village of Alamance’s administrative staff serves the citizens and is responsible for the day-to-day activities of the Town. These include, but are not limited to, preparing and implementing the annual budget, paying the Town’s bills, collecting fees and taxes, handling human resources functions, providing support to the Town Mayor and coordinating risk management activities to ensure the Town runs safely and smoothly. The Board of Aldermen holds their meeting the fourth Monday each month at 7:00 p.m.
May and December hold meeting on third Monday.